These Duncan Designed pickups come stock with the current production Squier Vintage Modified Jaguar. Before buying the Squier Jaguar I already had a set of Fender Pure Vintage 65's on hand , which I wrote about here, and so this review is mostly a contrast against that set. As with the Squier VM Jazzmaster, the Duncan Designed bridge is wound very hot relative to the bridge. Assuming 43AWG is used for the bridge, the 11.45k DC resistance is equivelent to 8.8k ohms, had it been wound with the same gauge of wire as the neck pickup. The bridge pickup has an inductance of 6.4 henries to the neck's 2.6H, and a loaded peak frequency that is 1.6kHz lower than the neck. Fans of P-90 style pickups have no problem with the clean tone of a pickup with such a low peak frequency, but it deviates quite a bit from vintage Fender specs and tone. Both sets use AlNiCo 5 pole pieces, though I measured about 10% stronger reading from the Pure Vintage's AlNiCo 5 pole pieces. 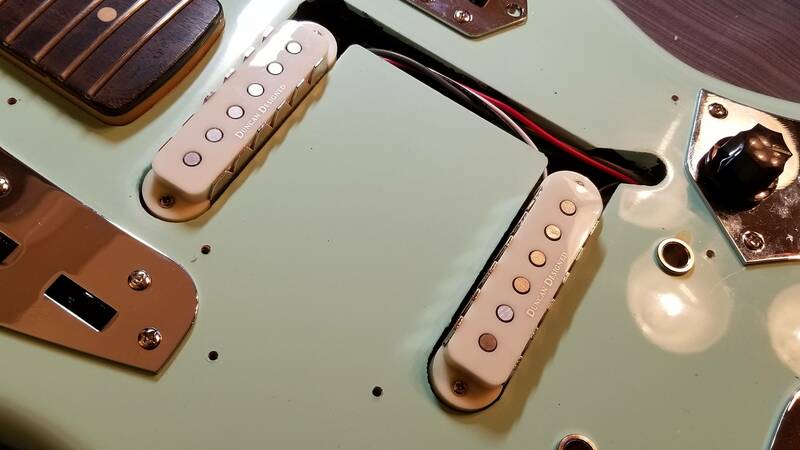 Where as the loaded peaks of the Duncan Designed are 2.3kHz / 3.9kHz, bridge and neck, the Pure Vintage 65 set has two matching pickups, each with a loaded (using the same load) resonant peak of 3.4kHz. So the Duncan Designed neck pickup is a bit clearer and closer to a Strat, the bridge getting close to a P-90, while both Fender Pure Vintage 65 pickups are wound closer to Telecaster pickup specs. A trivial difference is that the Fender coil wire uses a red insulation coat, supposedly enamel, where as the Duncan Design uses a more typical clear poly. Note that these DC resistances of Jaguar pickups are low relative to their higher inductance, that's because the steel shield boosts the inductance by a good amount, nearly 500mH, or ~15%, in the case of the PV65, which is much more significant than even the steel base plate on a Telecaster bridge pickup. The covers are not perfectly inter changeable. The widths of the metal shields, and the slot in the plastic cover differ by about a millimeter, but if you wanted to fit one over the other, it wouldn't be too difficult to modify the plastic cover slightly. As noted in the PV 65 review, even though the steel shielding helps complete the magnetic circuit around the coil, the voltage bump is only about 1 dBV. 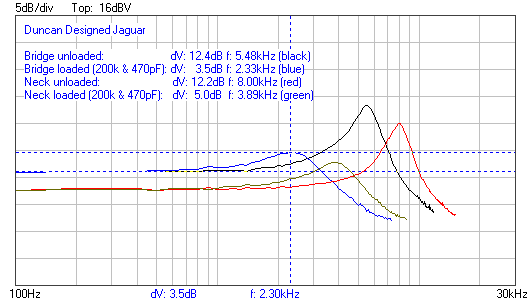 The actual voltage difference in testing was 0.21Vrms to 0.24Vrms at 500Hz. Because human hearing (and other senses) are logarithmic, even if a design detail such as this increases the voltage output by 15%, if the logarithmic difference only amounts to about 1dB, then the improvement ends up not being perceived anyway. This is why various pickup improvements, such as this one, end up getting dropped in the long run, for the sake of simplicity. Another thing I didn't realize until looking closer at Jaguar pickups is that it's evident that, even though the Seymour Duncan SSL-3, 4 and 5 are intended for Strats, Seymour Duncan used the Jaguar flatwork in order to avoid the flanged base of a Strat pickup's original flatwork. In my case, I decided to keep the Duncan Design neck and replace the bridge with the Fender PV '65. The wiring orientations between the DD and the Fender were opposite each other, so I did end up having to reverse the wires, as well as move the baseplate ground wire over to the other eyelet on the PV 65. Also on a side note, the fit and finish of the Squier Jaguar VM is killer, for any price point, but especially for $400, and the Duncan Design pickups, with real AlNiCo pole pieces, make for a great value as well. 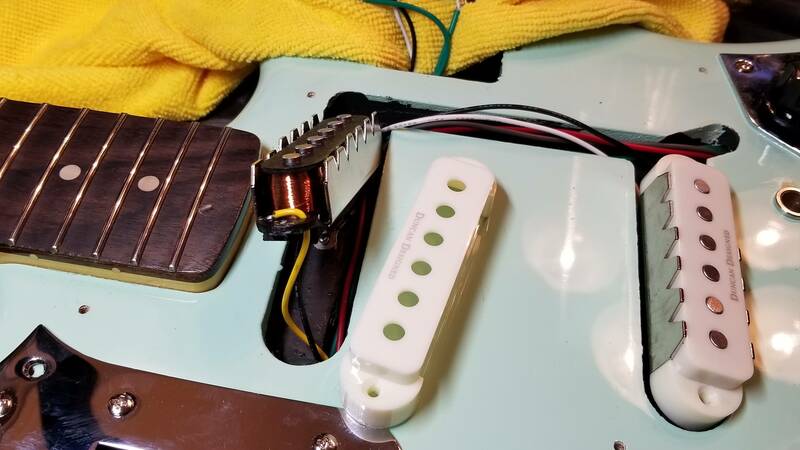 Like the Jazzmaster set, the hot bridge only has a 3dB output edge over the neck pickup, which means that the hot wind is really more about attenuating high end than it is making the bridge pickup loud. A lot of guitarists think of vintage bridge pickups as sounding "ice pick"-like, and a higher inductance bridge helps with that, even if the voltage bump is rather small. The higher DC resistance of the bridge pickup causes it's peak resonance amplitude to be 1.5dB lower than the neck pickup, or either of the Fender PV 65's. The calculated intrinsic capacitance is on par with other Fender single coils, and is not substantially different than the PV 65 set. Have you done any measurements or analysed any specs that would lead you to believe the '62 AVRI Jag pups to be closer to vintage correct than the '65 PV? Wow! That’s a serious review! Hope you do ,ore of them.